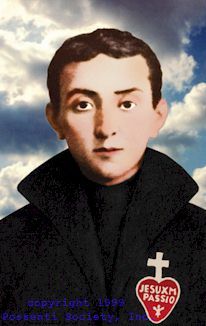 St. Gabriel Possenti was a Catholic seminarian in Isola del Gran Sasso, Italy. In 1860 he used his marksmanship skills to drive off a band of gangsters who were terrorizing the town. The St. Gabriel Possenti Society is dedicated to promoting St. Gabriel Possenti as the Patron Saint of Handgunners. The society is also promotes the study of the historical, philosophical and theological bases for the doctrine of self-defense.